The Miami-based (formerly of the Bahamas) cruise company made news today when a judge in Miami found the company negligent and fined them $1 million for a boiler explosion that led to the deaths of 8 crew members. The judge also awarded $13 Million in preliminary restitution to the families of the crew members who died and were injured. And he left the door open for further restitution. The explosion occured in May of 2003 on the SS Norway (formerly the France) when it was at its berth in Miami. As a result of the explosion NCL decommissioned the Norway and sent it to the scrap yard. It was later towed to India where it ended up in another court case because it hadn't been cleaned of toxic material. Eventually a judge in India gave the scrappers permission to tear down the Norway despite its high levels of asbestos. NCL also made news in 2005 when several disabled Americans sued the company for not providing proper access for people in wheelchairs and scooters. The case made it all the way to the Supreme Court where the final opinion came down in favor of the plaintiffs. Back then, the company claimed its Bahama-flagged ships were not under the jurisdiction of American law and therefore did not have to abide by the Americans with Disabilities Act. The effect of this last lawsuit was pretty important for all charter and passenger carrying vessels in the US, which until this point had more leeway in terms of providing complete access to people with disabilities. As the law stands now, a passenger vessel must provide people with disabilities access to all public areas unless the vessels operation or design completely prohibits such access. For example, obviously, you can't have complete access on a 18' runabout. 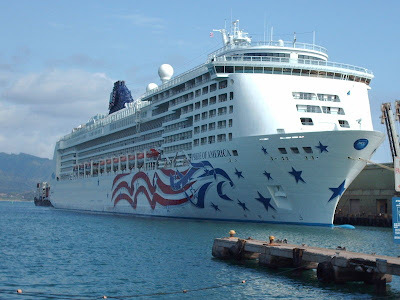 As a side note, NCL built the Pride of America, the first large US-Flagged cruise ship built in 50 years. Another Big Wave, On a Cruise Ship This Time. . .
Massacheusetts Ocean Billed Signed by Gov. Fuel Costs . . . Whatever The Market Will Bear? Suicide Divers - It was Only a Matter of Time! Right Whales, Fishermen, Ship Collisions. . .